Our Lady of Angels Retirement Home was born out of the mission of the Joliet Franciscan Sisters to meet the unmet needs of people. 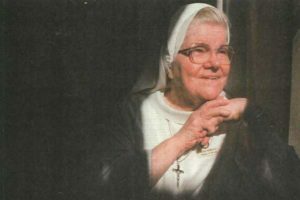 With the members of the Congregation living longer and the older Catholic population of the Joliet region looking for a place to retire, the idea of building a Catholic retirement home on land the Sisters owned on Joliet’s west side was conceived. On May 1, 1960, ground was broken! The Franciscans consider the Portiuncula, Our Lady of the Angels church, as the mother church of the Franciscan order. It was there that Francis heard the words, ‘go rebuild my Church, for it is falling down’. 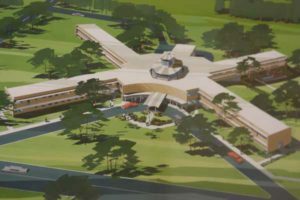 It was that name ‘Our Lady of Angels’ the Sisters selected for their new retirement home, the name of the church so dear to Franciscans around the world. 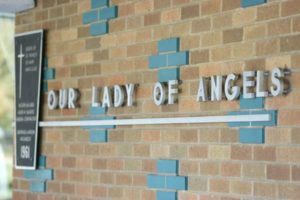 The feast of Our Lady of the Angels is August 2nd and is viewed as the birthday of the Congregation as well … duel reasons for the naming of this new facility. Residents began moving into the new facility in January, 1962. Infirm sisters were moved by ambulance from the sisters’ Motherhouse. On January 30, 1962, the first sister passed away at the new retirement home. 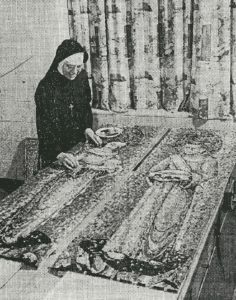 On July 1, 1962, the Sisters dedicated OLA. The physical beauty of the building gives witness to the Congregation’s long standing heritage of art, so much a part of the Joliet Franciscan Congregation. Mother Alfred Moes, the founder of the Congregation, was known for her artistic and architectural skills. Mother Charles Borromeo, general superior at the time of OLA’s construction, rejected the original design plans. From her experience with the Motherhouse Infirmary, she wanted a structure for the betterment of life for the elderly and sick residents. She wanted residents to have a “window to the world.” Her proposal of a wheel shaped structure was one of the first of its kind, now so popular with retirement homes. In keeping with the spirit of St. Francis of Assisi, this plan would allow each resident with a view to God’s wonderful creation: trees, birds, flowers and all the amenities provided by the change of seasons. The choice of brick for the façade gave a distinctive touch to the home, dedicated to the Blessed Virgin Mary. The chapel, at the center of the ‘wheel’, was at the ‘heart’ of this new home and would reflect the special devotion the Franciscans have to the celebration of the Eucharist and gathering together in community. The chapel mosaics reflect the Franciscan Seven Joys of Mary and were designed by Sr. Hiltrude Blames as are the murals of Francis and Clare that greet visitors as they enter the chapel. From its inception, the Sisters envisioned a level of care not typical in many facilities. At the insistence of the first director of nursing, Sr. Peter Didier, residents were to be treated with compassion and respect. Every resident would be fully dressed each day. Even those needing wheelchairs would be fully dressed with shoes and be seen at community meals. Ladies would wear earrings and some make-up. She would say, “When you’re dressed up, you feel better about yourself.” Quality and compassionate care are paramount! Not only was the residence home built to meet the needs of residents from independent living until the end of life, but in more recent years, the Sisters renovated part of the building as a rehabilitation wing (2007) and also created the Village, independent living cottages for purchase by seniors, looking for a more active, independent senior living community (2008).